The integration of European services markets and the implementation of associated European Union directives open up formerly closed national markets to competition from the Single Market. 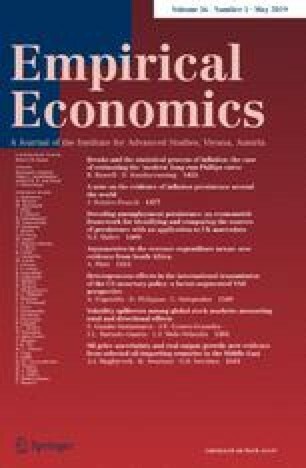 The purpose of this study is to measure the effects of liberalization on technical efficiency and the productivity development of the insurance industry. As an example we construct efficiency frontiers for the years 1992 through 1999 for the Austrian insurance industry using Data Envelopment Analysis. We use the resulting efficiency scores also to construct a Malmquist productivity index for the transition period. In search for effects from the Single Market, returns to scale, economies of diversification, and distribution channels we relate efficiency and productivity measures to several firm specific characteristics. For this purpose we use unbalanced and balanced panels of individual firm data. All correspondence to Thomas Url. The authors gratefully acknowledge valuable comments from David Cummins, Finn Forsund, Shawna Grosskopf, Michael Theil, seminar participants at the University of Vienna, the University of Business Administration Vienna, the Austrian Institute of Economic Research, the Austrian Insurance Association, and the SOR-Conference Jena, the EOR Conference Brussels, the 25th EGRIE Conference Vienna, and two anonymous referees. Ursula Glavninger provided valuable research assistance.